Alfi was skipping and dancing along the sandy beach at the Seaside. 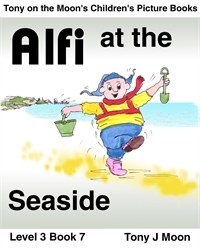 Alfi was at the seaside on holiday with his parents and had got up especially early to go down to the beach to see the sea. Podd his dog was also down on the beach with him but was now only a small blob in the distance.